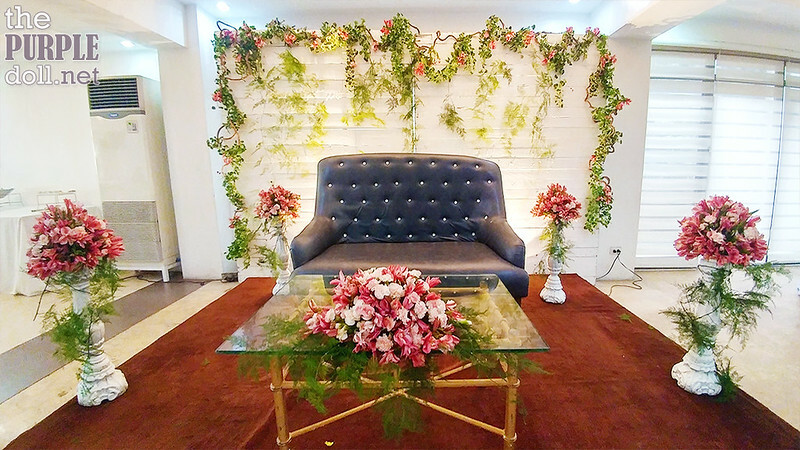 Although I may haven't gone to a whole lot of weddings, even just a bit of research would tell you which caterers are among the most popular for the past few years, or decades even. And one of which I've been hearing and reading a lot about is Josiah's Catering. Whether it be through GirlTalker, w@w or just a simple search on Google, there's always a mention of Josiah's. After getting in contact with Ma Del's, we thought we should check out other caterers as well. We got in touch with Josiah's pretty easily through their website. I believe they can be reached through email and social media too. But as for us, we just inquired for their rates and packages via the contact form on their official website, and an account executive sent me an email just a day or two after. It was also fortunate that they had a grand food tasting at Belleza Events Place the upcoming weekend when I inquired. 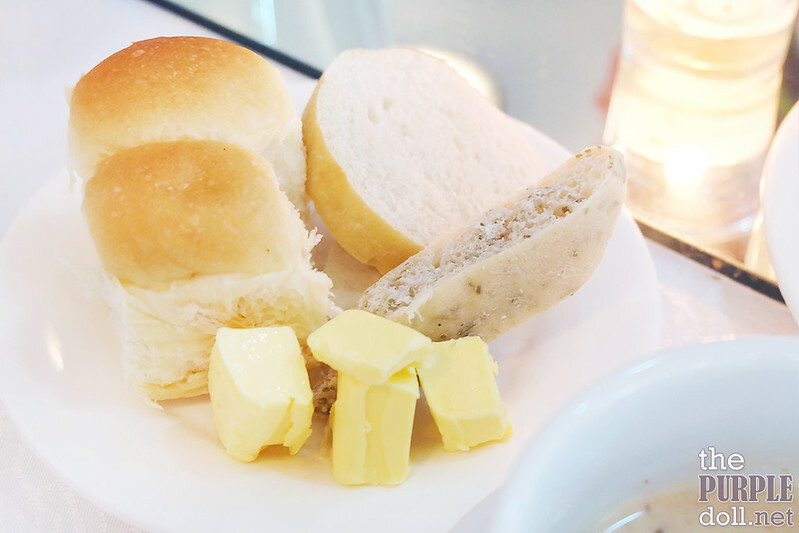 Though I believe, they also regularly hold food tasting sessions not just at Belleza, but also at other venues they're accredited and affiliated with. Side Story: We actually went to both Ma Del's and Josiah's for a food tasting on the same day. Haha! We were a bit crazy to have done that, but the schedules just aligned on their own and we had to go with the flow. We made sure "to eat only enough to taste the dishes" so we wouldn't get too full to appreciate (and properly gauge) the items served. Correct me if I'm wrong, but we believe Belleza Events Place is owned by Josiah's as there's a big logo of theirs at the venue. There's parking within the gated premise too, so bringing a car wouldn't be a problem. The place had a sample couple's backdrop with seating and presidential table set up when we got in. 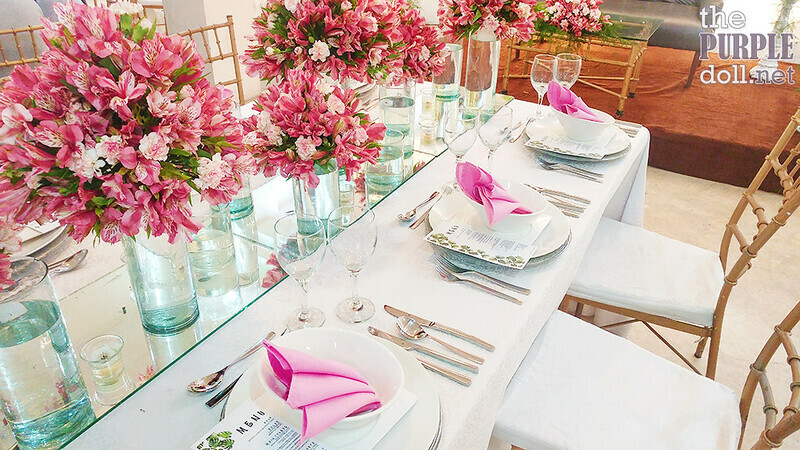 Not sure of the exact theme, but I think it was something along classic elegance or classic romantic with pink, white and probably greenery as motif. There were also round tables dressed in white linen with Tiffany chairs where food tasting attendees were to be seated at. And while the sample setup is far off our planned theme for the wedding, it was still nice to see. Unlike during our first food tasting at Ma Del's, Josiah's served their dishes as samplers so we can try more variety but not get too full. We had high hopes for Josiah's, so we were quite disappointed when we got to try their welcome treats. 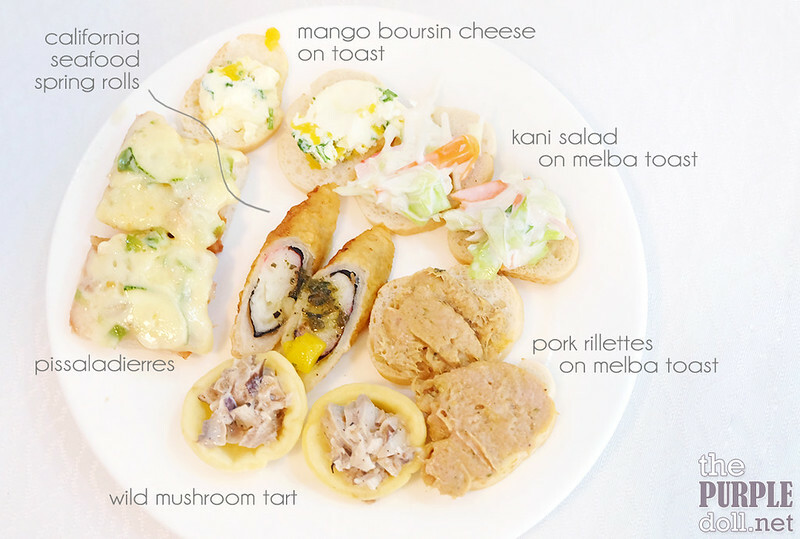 The toppings on the melba toast were okay, but the melba toasts themselves were too soft and a little soggy. The bread for the pissaladierres wasn't spared either. Only the mango boursin's toast was crispy and the mango boursin tasty. But sadly, this item is not part of our package (Classic). It's not even on the Luxe 1 and Luxe 2 menus! The wild mushroom tart was just okay. The California seafood spring roll was also just okay, though I guess kids would like this as the casing is made of fish cakes (or something similar). Since the first caterer we went to also served a mushroom soup, the fiance and I got to really compare them. And between the two, Josiah's is far better. The consistency isn't too thick nor too watery, just right. You can also taste the mushroom flavor and even feel the subtle texture of the finely minced (or blended?) mushrooms. It also wasn't too salty or have too strong of a mushroom taste. 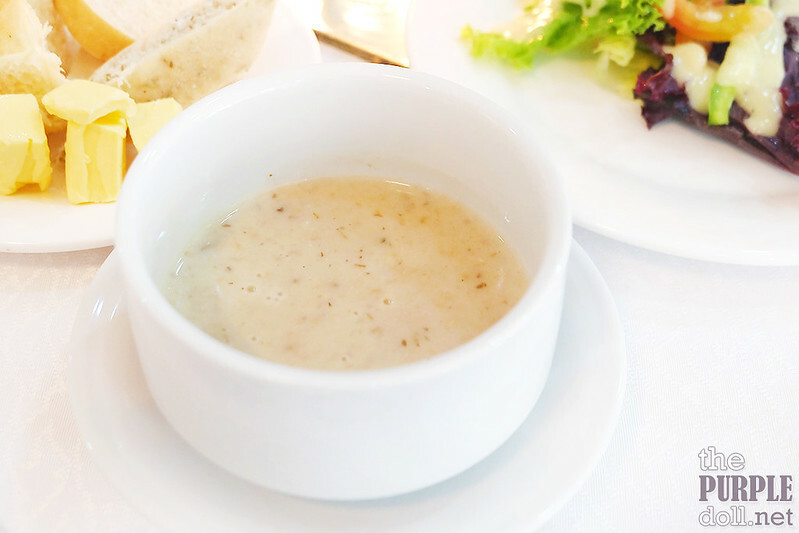 In our books, this was the perfect mushroom soup. Again, sadly, this soup is not part of the Classic, Luxe 1 nor Luxe 2 packages. It was written on the food tasting rating sheet that there would be 3 types of salad served. However, in actuality, they only served 1 (which made the fiance even happier). I don't normally gush over salads, so this was just okay. If I have to nitpick though, I'm wondering where the Parmesan cheese went. 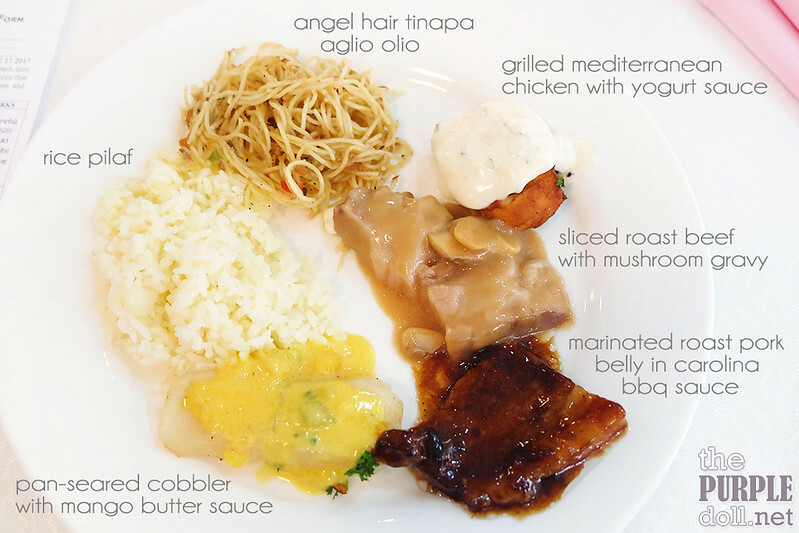 We were served 2 plates for the mains, with sampler sizes of all the hot items they had during the tasting. To be honest, these dishes -- chicken with yogurt, roast pork belly in bbq sauce, and fish with mango butter, I couldn't even remember the taste. So I guess, they were just okay -- not good enough to be remembered, but not bad enough to not be forgotten. Thankfully the tinapa aglio olio was not that bad. We found the lack of actual tinapa on our serving a little disappointing since the flavor of just the angel hair was subtle, so the tinapa bits would've added the needed saltiness. 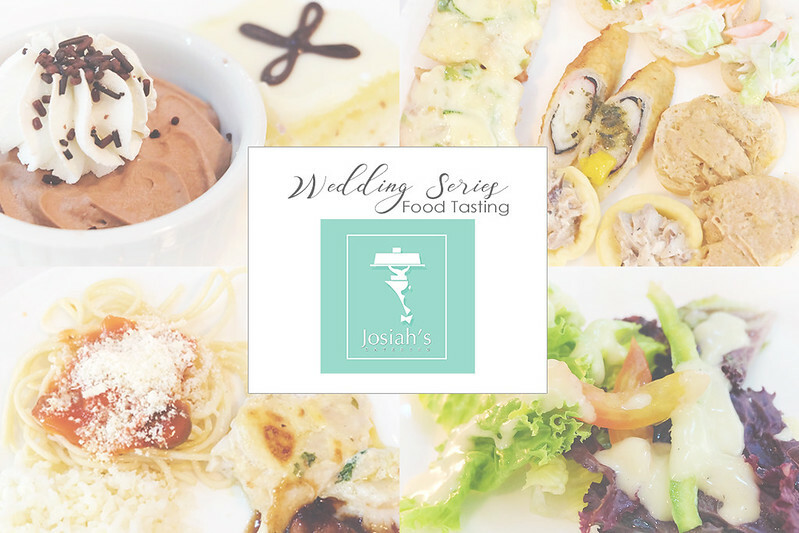 Since it has been over a month away since we've had our food tasting at Josiah's, I can't exactly remember anymore the texture nor the taste of the sundried tomato and cream cheese roast chicken, and the spinach and mushroom cobbler. However, what I do remember is liking the chicken dish, so that one was probably pretty good. The fiance gave it a pretty okay grade on his rating sheet too. Sadly, we can't say the same for the spaghetti. As much as I like my pasta tangy, this one just tasted weird. Our serving didn't have seafood in it, but the sauce was a combination of tangy and a little slimy. And I've had my fair share of tomato-based pastas with seafood. Sigh. 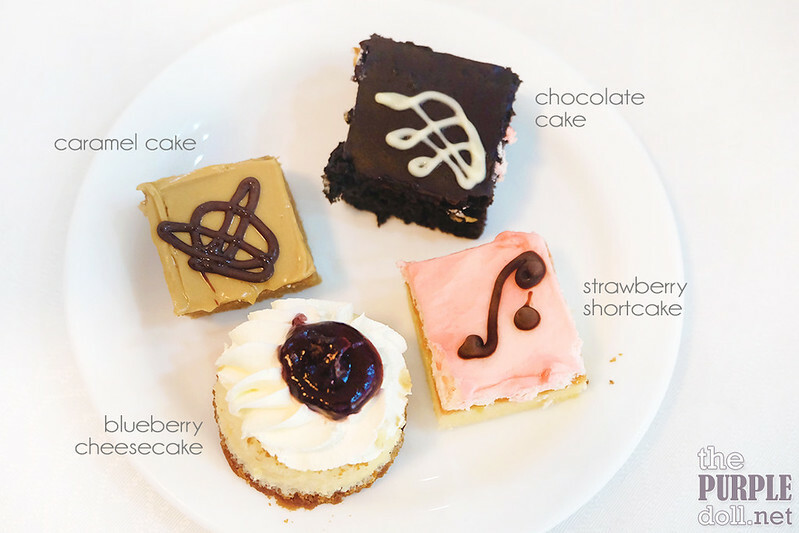 For sweets, we were served with cake samplers. All of them are okay in my book. They were pretty moist, not too dense and had just the right amount of sweetness. The fiance especially liked the caramel cake. I'm not sure if I'm remembering correctly, but the white chocolate cake was a little sweeter than the other flavors, which is why it wasn't my favorite. 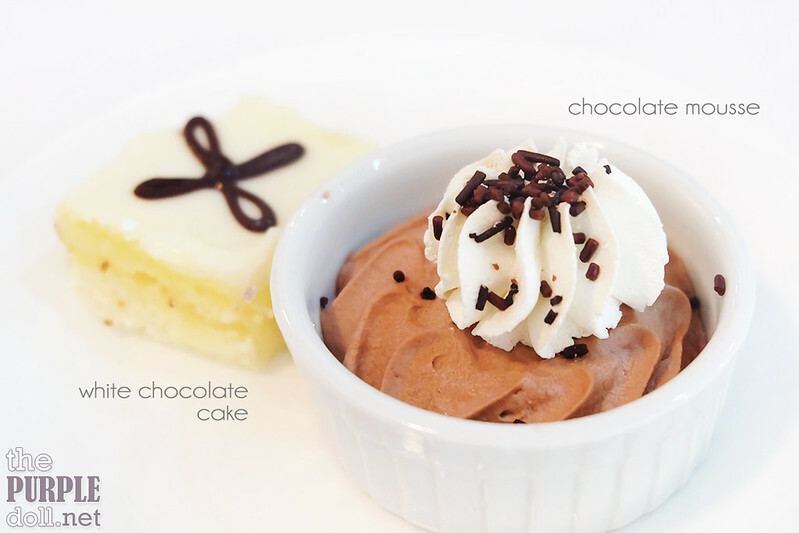 The chocolate mousse was like a breath of fresh air though among all the cakes we tried. And although we got to try quite a lot of desserts, all of these, save for the blueberry cheesecake, aren't even in our package. I was actually looking forward to the opera cake, and peach & mango panna cotta. We inquired for the most basic package (the Classic Menu) at Josiah's Catering, and it definitely wasn't inexpensive. The account executive assigned to us was pretty generous with the food-related freebies though, giving us 6 kinds of welcome treats instead of just 3, an upgrade to salad bar with 2 dressings, 2 sauces for pasta, 6 kinds of desserts instead of 2, and 1 round of soda on top of the refillable iced tea. 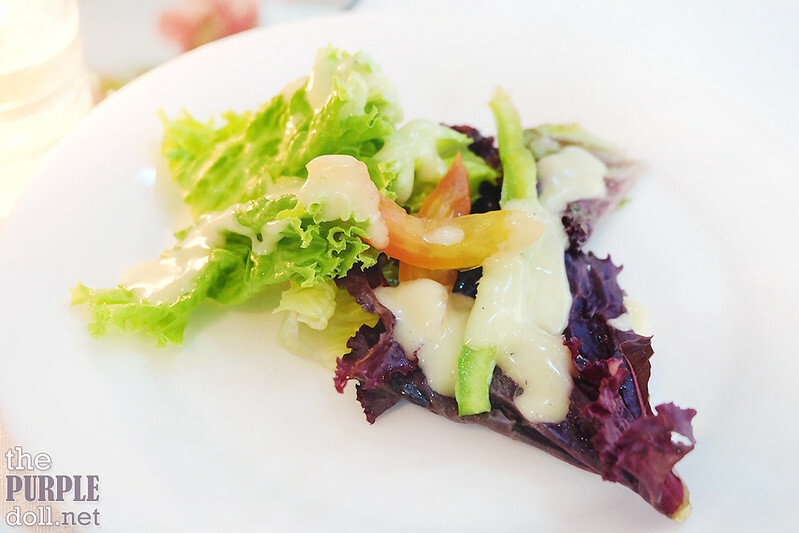 Josiah's Catering has been one of the most popular and credible caterers in the industry. However, we're not sure what happened during our food tasting. 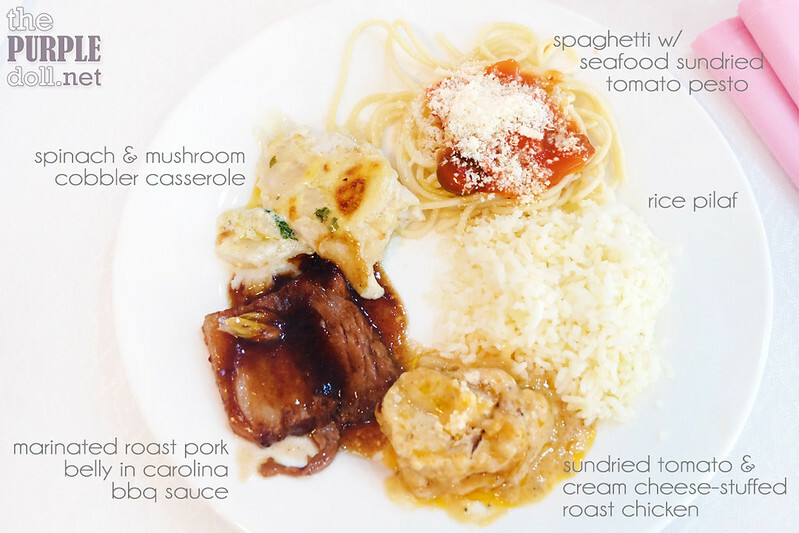 While there were a few items that really stood out and we consider the best we've tried among all the caterers we've had food tastings with, there were also some dishes that were really, really disappointing. The servers at the food tasting were good though. Some were more attentive than others, but they're generally courteous. Will we book this supplier? No. Maybe the chef was just having a bad day, or maybe this was just a one-time thing. But sadly, the uncertainty is something we want to manage (as much as possible) in a big event such as our wedding. Price-wise, 120k for just the food and setup for 100pax is also on the higher spectrum of our budget. For this price, we were at least looking to include some non-food-related freebies. However, while we're not getting Josiah's for our event, we hope to attend one with them as the caterer. Despite our initial experience, we want to be proven wrong.